The recent concerns over the “advocacy chill” highlighted systemic problems in the relationship between the government and sector. The newly elected federal government has given the Canada Revenue Agency (CRA) and the Department of Finance the mandate to clarify the rules governing political activity and develop a new legislative framework to “strengthen the sector”. But mending the sector-government relationship will require transformational shifts that go beyond legislative changes and CRA rules. Partnership and the ability to work collaboratively across government departments and with outside partners will be crucial. Good evidence-based research can help the government deliver on its promises and guide the process of partnership building towards a shared goal of enabling social impact. In the months leading up to the 2015 federal election, charities and their political activities became a hot-button issue. Widespread attention from media outlets and party leaders focused on the perception that the federal government was engaging in political harassment of the charitable sector using the audit process of the Canada Revenue Agency (CRA). The audits seemed to focus on the political activities of environmental groups and other charities perceived to be inconsistent with the ideology of the government.1 The concerns fed fears that the government was trying to suppress the advocacy efforts of charities, resulting in the perception of an “advocacy chill” in the sector.2 Despite reports of the potential political bias and punitive nature of the audits, the CRA stood by the integrity of their process, stating that audits are conducted free of any political interference. Some would argue, however, that the debates over political activity and advocacy efforts are a symptom of a larger issue. 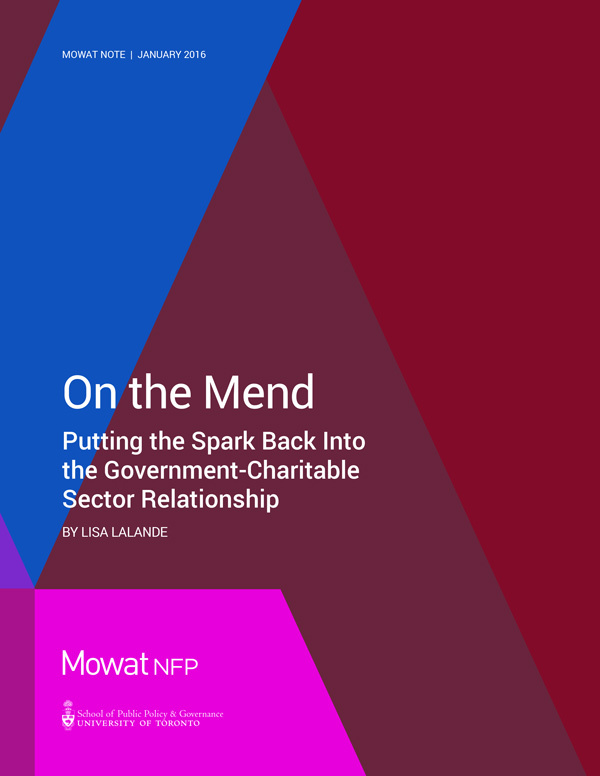 The discussion reveals more systemic problems in the relationship between the government and sector – including how unwieldy the legislative frameworks governing the charitable sector have become. The newly elected federal government has responded to public concerns by committing to increased transparency and fairness in the CRA’s practices. These commitments have opened the door to policy change on two fronts: in relation to the specific rules on political activity and advocacy, as well as to the regulatory structure governing the sector more broadly. The government has given the CRA and the Department of Finance the mandate to clarify the rules governing political activity and develop a new legislative framework to “strengthen the sector.” But mending the sector-government relationship will require transformational shifts that go beyond legislative changes and CRA rules. Partnership and the ability to work collaboratively across government departments and with outside partners will be crucial. So how can the sector and government work together to advance these promises? What information is required to guide their efforts over the coming months?